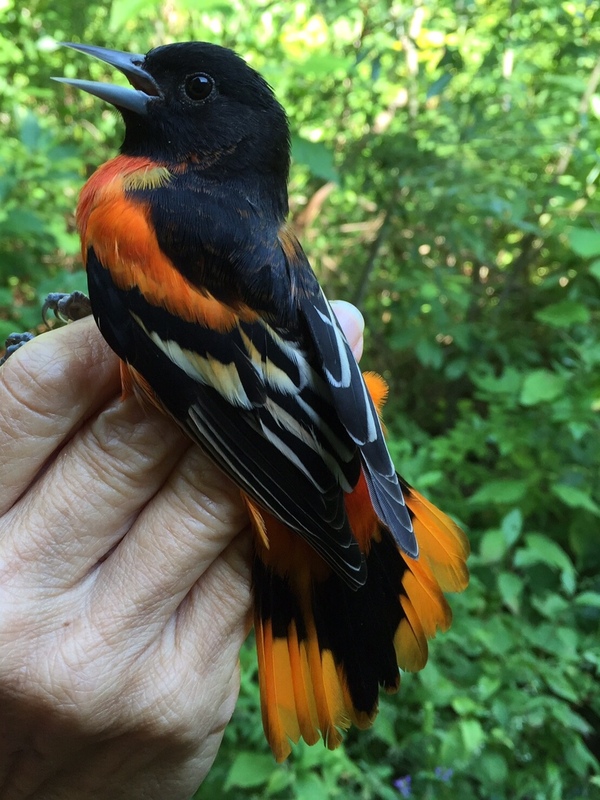 Sunday August 30, 2015: 16 new birds of 12 species; 10 recaps. Bird of the day was Magnolia Warbler with 5 new bands. There was no other species with more than one new bird banded. The clouds hung low and the air never stirred. It was quiet and humid, and felt sort of oppressive. Perhaps the birds felt it too, as there was little chatter and even less movement. With the exception of the excited Pileated Woodpecker(s) overhead and a small flock of swallows early on, we saw few birds in the area. Our nets were similarly empty, so we just concentrated on enjoying the handful of birds we had. A whole lotta nuthin’ . . . . then Blackpolls! Andrea Patterson	Fall Banding	Comments Off on A whole lotta nuthin’ . . . . then Blackpolls! Saturday August 29, 2015: 43 new birds of 17 species, 13 recaps. New species: Blackpoll Warbler and Bay-breasted Warbler. Bird of the day was Gray Catbird with 7 new bands, followed by Magnolia Warbler with 6 and Eastern Wood-pewee with 5. We had a great run to start the day, but after about an hour we hit dullsville! We got one or two birds each run, so Jenna ran the station while Andrea tightened nets and trimmed low-hanging branches. Near the end of the day, a small group of birders stopped by. Unfortunately, we were only able to show them a single catbird. We closed on the next run . . . and got about 15 birds. Among them were three Blackpoll Warblers and two Bay-breasted Warblers – the first of the fall season. August 28, 2015 52 new bands and 11 recaps. The banding crew had to work hard with some of the puzzling fall birds! We had birds in almost every run! brookser	Fall Banding	Comments Off on Wiiiiiillllll-sonnnnnnnnnn! Thursday August 27, 2015: 24 birds of 13 species; 12 recaps. New species: Wilson’s Warbler. Birds of the day were Yellow-bellied Flycatcher, Least Flycather, American Redstart, and Magnolia Warbler each with 3 new bands. The first run of the day was pretty exciting with 8 birds brought in, but occasional sprinkles dampened activity for the next few hours. We ended the day with 8 species of warbler, though, so no one was complaining. The first Wilson’s Warbler of the fall was nice to see, but it’s more fun when Ryan is here to call out Wiiiiiilllll-sonnnnnnnn! So . . . we did it for him! Wednesday August 26, 2015. We had a pretty slow day, but at least the weather was not hot! We banded 17 new birds, of which Magnolia was the numerous with five being banded. 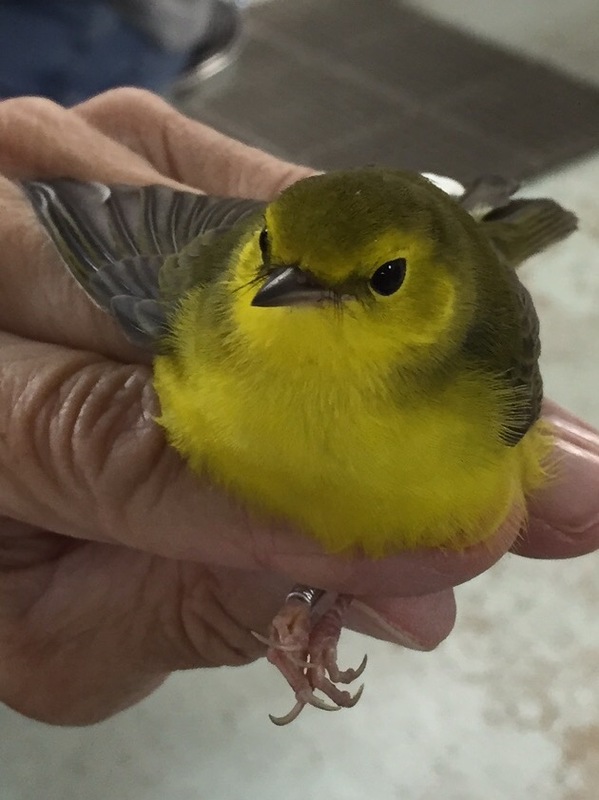 Seven other warbler species were banded, including one Northern Parula, which was new for the season. Non-warbler species included three Gray Catbirds, one House Wren and one Wood Thrush. We had 10 recaptures and two hummers were released unbanded. Tuesday August 25, 2015: 10 new birds of 5 species; 9 recaps. There was a five-way tie for bird of the day. Traill’s Flycatcher, Black-capped Chickadee, Gray Catbird, Northern Waterthush and Common Yellowthroat all clocked in at two birds each. Today, we had two students join us. Julia took the Bander Training Class last spring, and will be coming out to volunteer each Tuesday. She processed all the birds, and her measurements were spot on. She learned how to skull birds (since that’s the most reliable way to age them in the fall), and did very well. Our other student comes to us from Hobart and William Smith Colleges. Joe will be taking an independent study course, part of which involves banding at our station and taking the bander’s training course. He learned some basic bird handling skills this morning, and then started net-picking. It’s hard to learn when there are so few birds, but I guess we don’t get to tell the birds when to migrate!